John Matson was all in preflop holding [Qd][Qc] and was in a "classic race" with Bart Fooden's [Ad][Ks]. The [7d][Td][Jd] flop gave Bart a flush draw and a gutshot to go with his two overs. 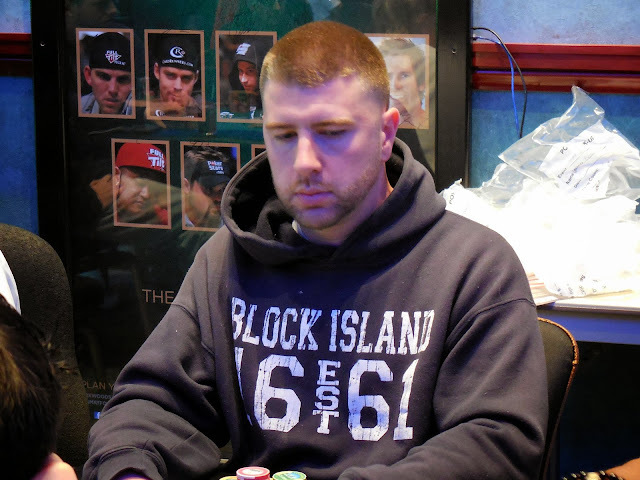 The [3c] on the turn changed nothing, but the [8d] river completed Bart's flush, eliminating John in 4th place. He will collect $3,423 for his efforts. Andy Spears picked up a cooler to be eliminated in 5th place. His [Ac][Qc] ran into his opponent's [Ks][Kc]. The flop came king high, and Andy was unable to catch runner runner to survive. He will exit this tournament in 5th place, good for $2,588. On a T-8-x flop with two diamonds, Kurt Magalski moved all in for 92,000 and was called by Alex Feiner. Hassan Barbajane moved all in over the top and Alex called all in. Kurt was in the worst shape with ace-ten, good for top pair. Hassan had flopped a set of eights, and he would knock both opponents out if he could dodge Alex's flush draw. The turn and the river blanked out, and Kurt will exit in 7th for $1,502 while Alex will take 6th for $1,947. Andy Spears was all in with [Td][Tc] and was flipping for his tournament life against Bart Fooden's [Ad][Ks]. The [2d][Th][7d] flop was just what Andy was hoping for, leaving Bart to need running straight or flush cards to win. The [8c] turn left him drawing dead, and Andy will double up to 210,000. 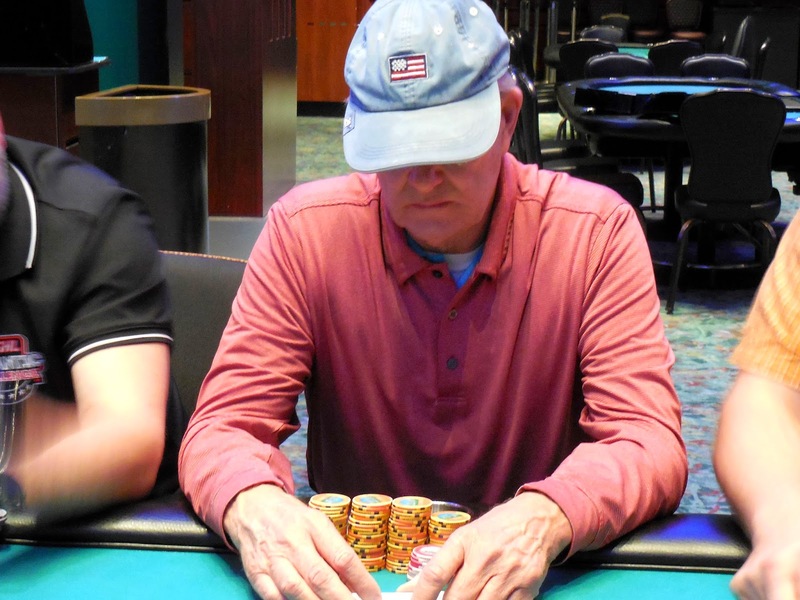 James lost most of his chips when his pocket tens fell to Kurt Magalski's ace-nine, and he got the last of his chips in against Andy Spears and Mike O'Connell. The two players checked all the way to the river, and Kurt's king high could not beat the other two players' ace high. James will exit this tournament in 8th place, good for $1,182. 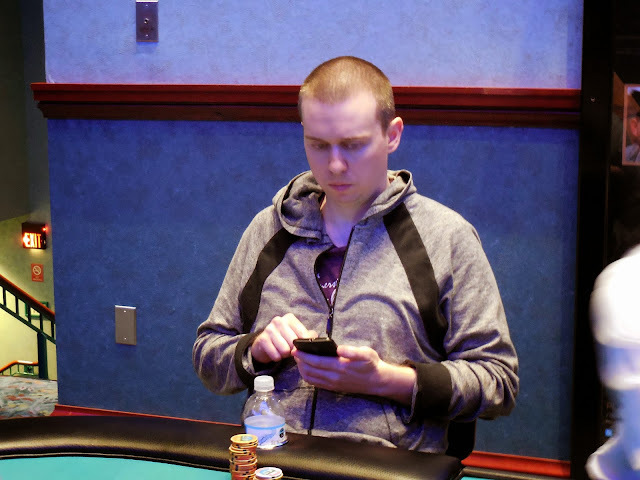 On a [Qs][6h][Js] flop, Steven Weeks was all in holding [Jh][Ts]. 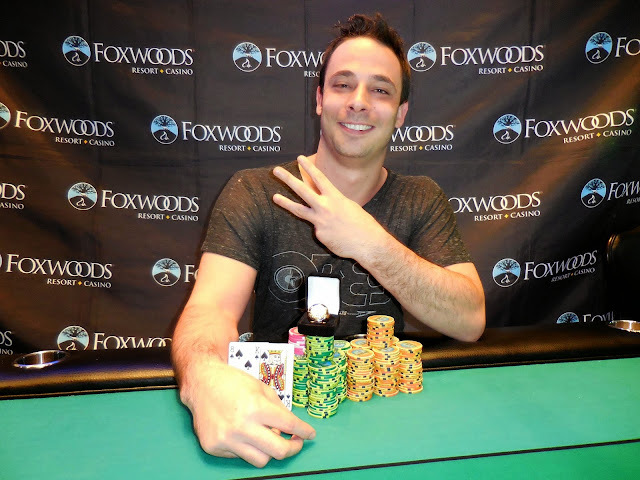 It was the best hand as Ryan Eriquezzo held [Ks][8s] for a flush draw and an overcard. Ryan had knocked out many opponents at this final table, and the [3s] hit the turn to make it one more. Ryan completed his flush to eliminate Steven in 2nd place, good for $14,025. Ryan will take 1st place for $22,684 along with the World Series of Poker Circuit ring and the title. This is Ryan's 3rd ring, and a full recap of his win can be found at wsop.com. Congratulations, Ryan! 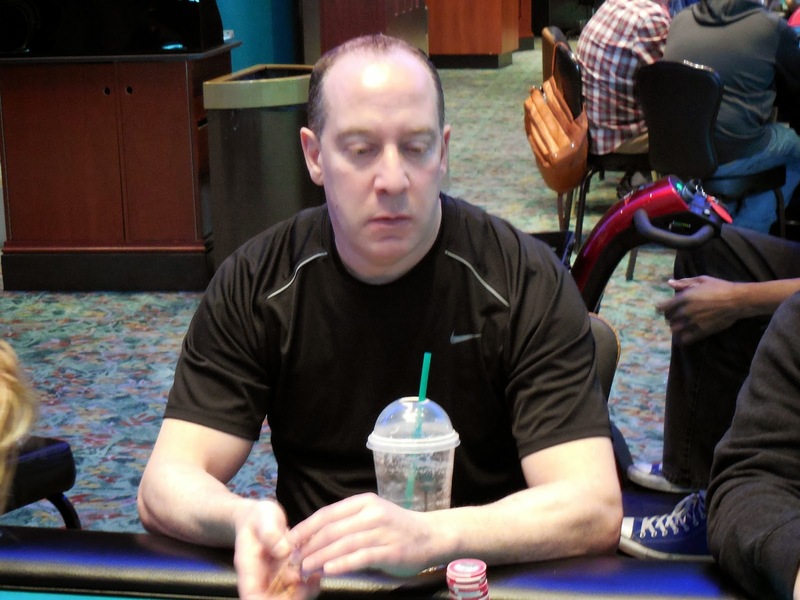 Chris Milano got the last of his chips in with [Ac][Ts] but was up against Ryan Eriquezzo's superior [Ah][Kh]. 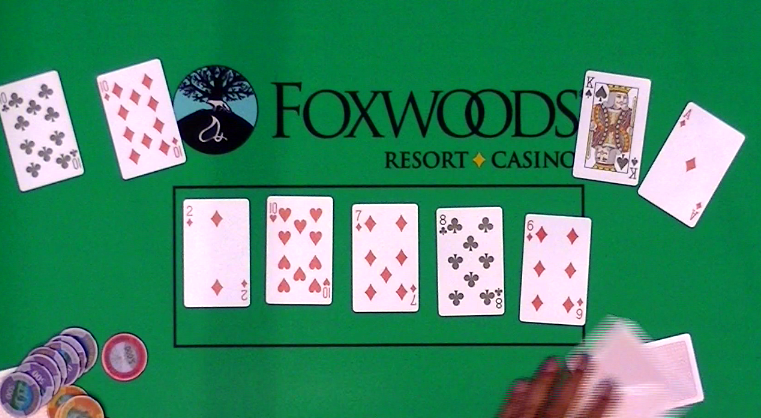 Chris was looking to pair his ten, but the [6h][Jc][7c] flop was no help. The [Qc] turn gave Chris a flush draw and a gutshot straight draw, but the [3s] was a blank to eliminate him in 3rd place. Chris will collect $10,183. 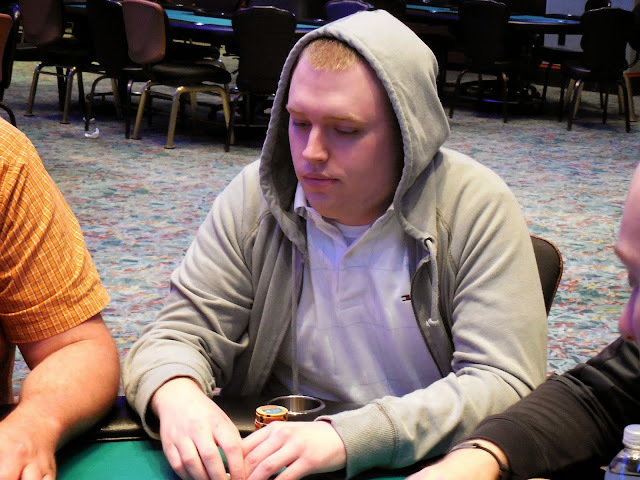 Ryan Eriquezzo opened from the button before Zach Daly moved all in from the small blind. Steven Weeks folded his big blind, and Ryan snap called, tabling [Th][Tc]. Zach would need to catch up with his [As][8c], but the [9s][2h][7h] flop was no help. The [2d] turn and [7c] kept the pocket tens in front, and Zach will exit this tournament in 4th place, good for $7,529. 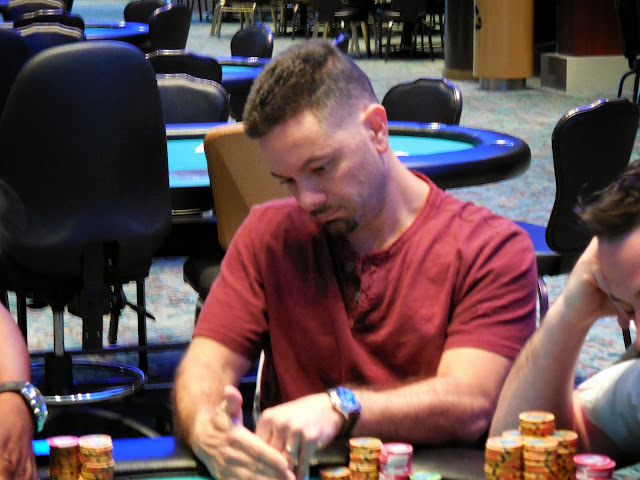 On a [Jh][8h][8d][9s] board, Joe Frizzi bet after Ryan Eriquezzo checked, but was then met with a check-raise. Joe made the call, and the two saw the [4s] river. With about 350,000 in the pot already, Ryan eyed Joe's stack and saw that he had less than a pot sized bet. Ryan moved all in and put Joe deep into the tank. After some thought, he called all in, only to be shown ten-seven for a straight. Joe mucked, flashing a jack as he did so. Joe will collect $5,647 for his 5th place finish here today. It seemed as if Anthony Hoskie had nine lives, being all in and at risk with the worst hand no less than three times at this final table. One of his suckouts included cracking Ryan Eriquezzo's pocket kings with eight-six off suit. Another had his [9h][5c] making trip nines to beat Joe Frizzi's [Ac][4c]. On his final hand, Anthony took his [Kc][6d] up against Chris Milano's [Ac][Jd]. It looked as if Anthony would have one more life as the flop fell [Kd][Th][7h], but the [As] turn left Anthony looking for a five outer. The [3c] was not what he needed, and Anthony will exit the tournament in 6th place, good for $4,305. 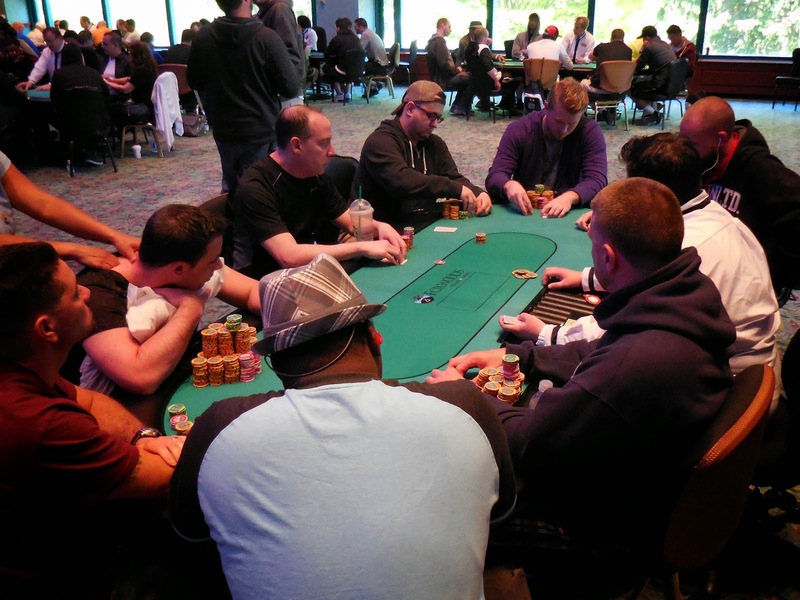 Eric Miller got the last of his chips in with ace-eight against Ryan Eriquezzo's pocket threes. It was another coin flip at this final table, and Ryan proved to be unstoppable as the board ran out [Tc][Ks][6h][7s][Jc]. 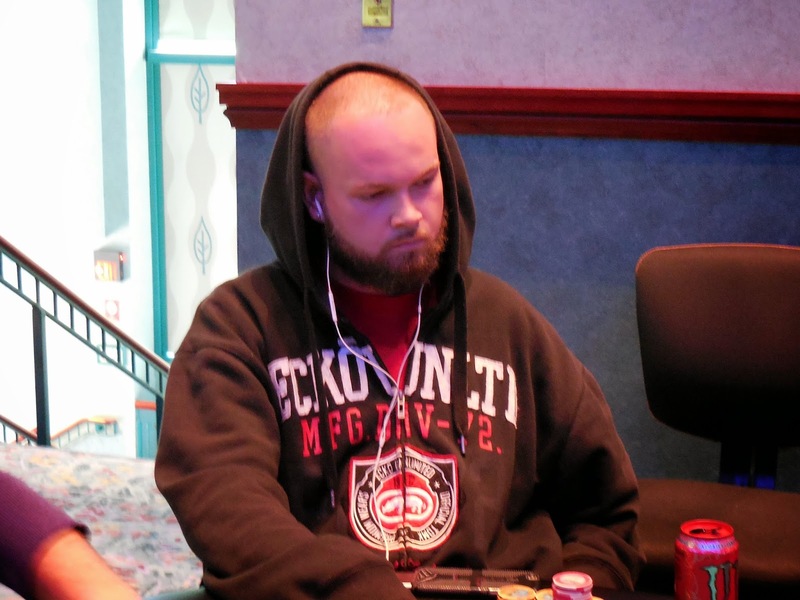 Eric will exit this tournament in 7th place, good for $3,340. We've seen two eliminations in the last 45 minutes, but we've also seen two players dodge eliminations. Eric Miller just doubled up when his suited ace-king flopped a flush against Chris Milano's pocket eights. Chris did flop a gutshot straight flush draw, but the one outer did not come. Eric now sits on 160,000 while Chris gets knocked down to 170,000. A few hands back, Zach Daly found himself on the right side of a cooler when his pocket kings held up against Anthony Hoskie's pocket jacks. 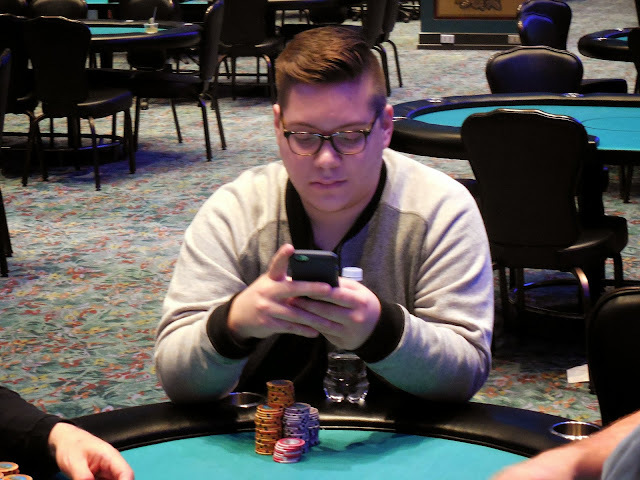 Zach doubled up, but Anthony was able to win a few pots and then double up with pocket fours against Josh Krasnecky's king-deuce to keep him in the game. Anthony now has 210,000. Matthew Venditto was all in preflop with [As][Ts] and was racing against his opponent's [8h][8d]. 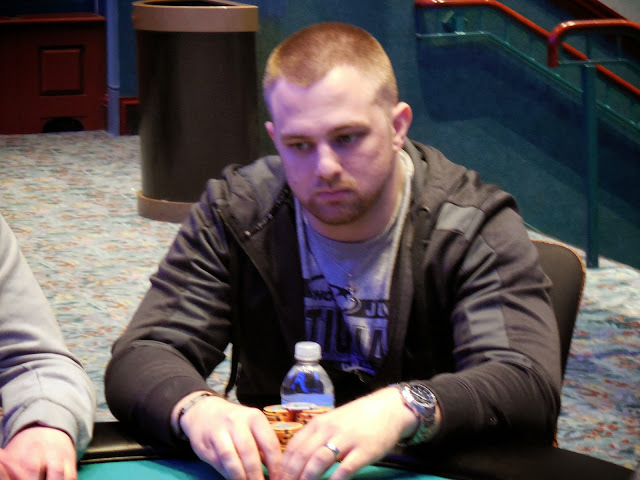 Matthew could not connect as the board ran out [2d][Jd][7s][Kh][5c] and he will exit this tournament in 9th place, good for $2,109. Brad St. Vincent has been eliminated. The first four levels will be 50 minutes, and then 60 minutes afterwards.